There was no need for this tempest in a teapot. Both songs charted well, with “Because” slightly ahead. In 1964, “Because” went to #3 on the U.S. Billboard Hot 100 and Canada and #7 on the U.S. Cash Box Top 100. “Can’t You See that She’s Mine” went to #4 on the U.S. Billboard Hot 100 and #4 on Cash Box. Both songs sold more than one million copies and earned RIAA gold records. “Because” was also released as the first track on The Dave Clark Five’s 1964 album American Tour. There have been numerous covers of the song, with versions by The Supremes and Julian Lennon. 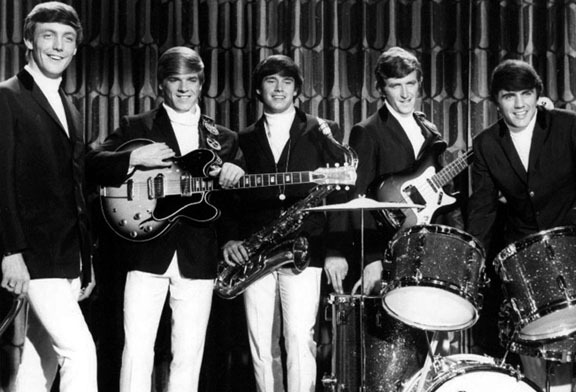 The Dave Clark Five consisted of Dave Clark (drums), Mike Smith (organ and lead vocals)), Lenny Davidson (guitar), Rick Huxley (bass), and Denis Payton (tenor and baritone saxophone). They had what was called (for promotional purposes) the Tottenham Sound, as they had formed in Tottenham, London, England. The term was a response to the Mersey Beat sound of the Liverpool, Manchester, etc., bands. Anyway, they had a great big beat, and added texture with the saxophone. Their songs were generally light and entertaining. The Pass the Paisley Groove Pad is a resting stop, a place to chill out and listen to the featured song on the stereo. If the mood strikes you, click on the juke box to access and listen to the 50+ free online songs there. The TV has several channels, with selections updated twice a week. Every now and then, Pass the Paisley hosts an all-request of 1960s and 1970s songs for a Be-In at the juke box in the Groove Pad. Keep on truckin’. Hope you enjoyed “Because” by The Dave Clark Five. Brings back lots of great memories!! !